The Nominal Roles of the RCR of the South Africa War show that Private Cunningham was a Militia soldier of the 20th Halton Rifles when he volunteered for service in South Africa. 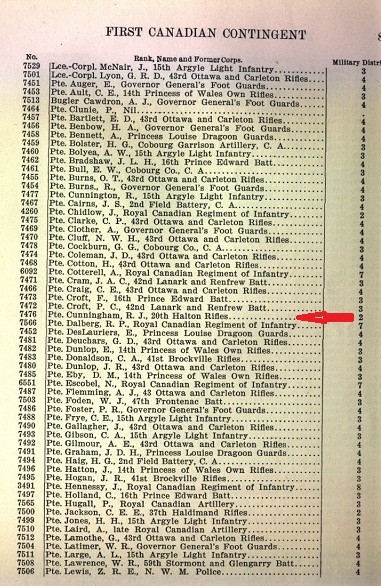 He was the only man from that unit to serve in the First Contingent with The RCR where he served overseas in “D” Company (information courtesy Michael O’Leary). The 2nd Battalion, Royal Canadian Regiment of Infantry was Canada’s first volunteer unit sent to South Africa. The Battalion played an essential role in defeating the Boer force at Paardeberg in February 1900. Paardeberg was the first major British victory of the war. A letter was received from R.J. Cunningham at Paardeberg Drift while serving with the first Canadian Contingent in the South African War. “I take pleasure in sending you a few lines to let you know that I’m living still. When I say that, I say quite a lot, as I consider anyone lucky that has come safely through what we have so far. I will give you a slight idea of the first fight, on Sunday, February 18. The night before we had one cup of tea and a biscuit at 4 p.m. and at 6 p.m. we started on the march to encounter the Boers here. We marched all night — a distance of 21 miles. We reached our destination at 8 the next morning and our cooks commenced to prepare some coffee, but before it was done we had to go. As we could not get our coffee they gave us two tablespoons of rum each and we started. We advanced on one side of the river half a mile to a crossing. We retired a short way and then swam the river. We were as wet as could be all over, but we didn’t mind it, for we had something to laugh at. We marched right into the firing line and opened fire. We were 10 hours under a terrible fire, and at dark we found the enemy had retired, so we started to collect our dead and wounded and they were many. Through the day we had just got nicely dried when a terrible thunderstorm came on and soaked us again. The Gordons gave us great praise, as did Field Marshall Lord Roberts. Our night attack was successfully carried out, but if ever I gave up a life it was that night, for we were right on the trenches when a thousand rifles opened on us. 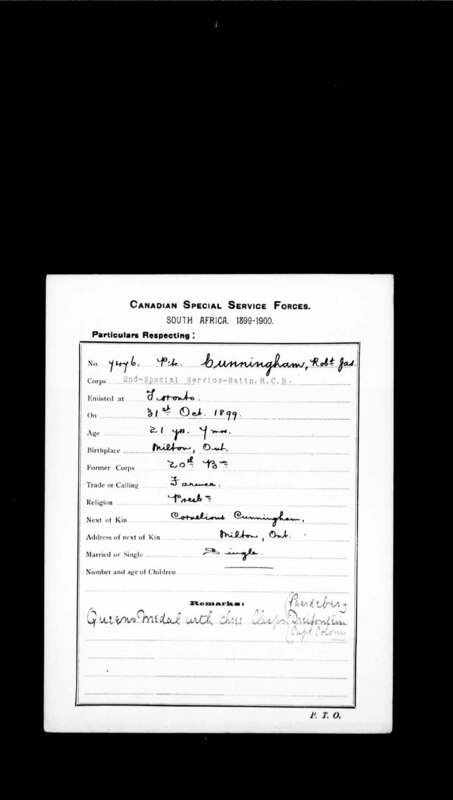 Sergeant-Major R.J. Cunningham of this town has applied for a commission on the fourth Canadian contingent for South Africa and yesterday evening’s Toronto Star said that although no official announcement had been made in the matter, it was understood that he would get it. His record on the first contingent at Paardeburg and elsewhere is familiar to his friends.